I’ve spent the past week designing the general look of the garage and trying to decide which ideas to include and what to cut out. One of the key points I keep going back to is that it needs to withstand a sustained hammering from an enthusiastic 2 year old who likes to a play rough! With this in mind I’ve cut back on any sticky-out parts to make it as robust as I can, but tried to still keep the feel of MK8 and specifically the Mario Motors from the Yoshi Island Course. Below is my final working sketch of the garage. The front of the main building is directly inspired by Mario Motors with its curved front and the ‘Mario with tyre’ picture logo on the top right. I’ve added a ramp to the left side in homage to the garage my dad built for me (which started me off on this whole project) and a parking lot on the roof. One thing I love about the Mario Motors is the coloured tyres surrounding the edge of the lot – something I’m hoping to recreate on my model along with the Mario and Yoshi themed petrol pumps on the forecourt. Re-created version of an MK8 sign. I was thinking about hand painting all the signs etc. but they’re going to be far too detailed for me to make a decent job of so I thought about using printed images. I took lots of photos of the signs and details in the game with my phone direct from the TV and they look really bad, I also tried the screen share thing on the Wii U but they came out pretty rough too so in the end I’ve decided to recreate the ones I need using Photoshop. Using the photos I took as the basis I’ve found some great assets online like red shells, Chomp Chomps etc. 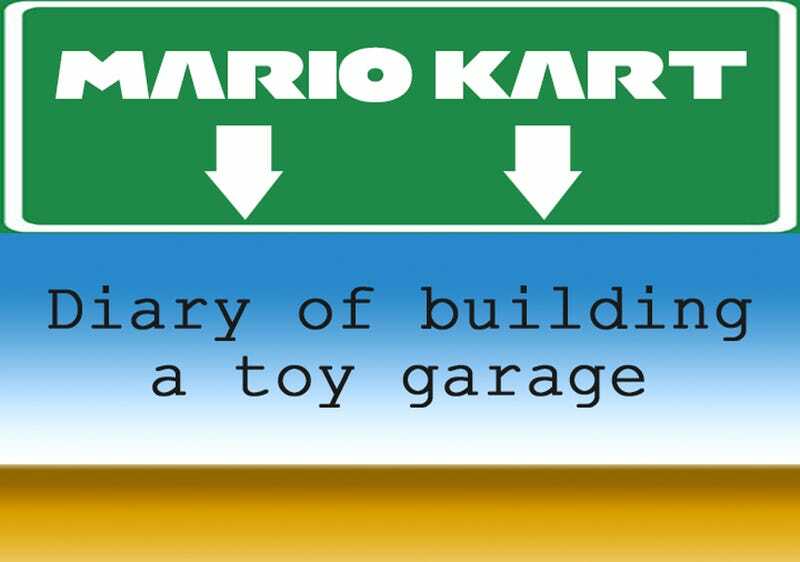 (the http://mariokart.wikia.com/ has been a valuable image resource) Then using various layers, textures and text styles I’ve been recreating my own versions of the signs (and even making up my own! ), please see above and below. Some more of the re-created MK8 adverts plus my own Waluigi one! They aren’t exact copies but they’re close enough to look the part. I’m planning to print them on to thick paper so I can cut them out and stick them directly onto the wood with strong glue. I’m not sure about applying a finish to the signs yet – I think I might just leave them instead of trying to cover them with varnish but I’ll do a couple of tests to make sure. The sign for the front of the garage. Over the next week I’ll carry on making my own versions of the signs and I’ll do the barrels and question mark blocks that way as well. I’ll also start to buy all of the wood I need for the actual build.